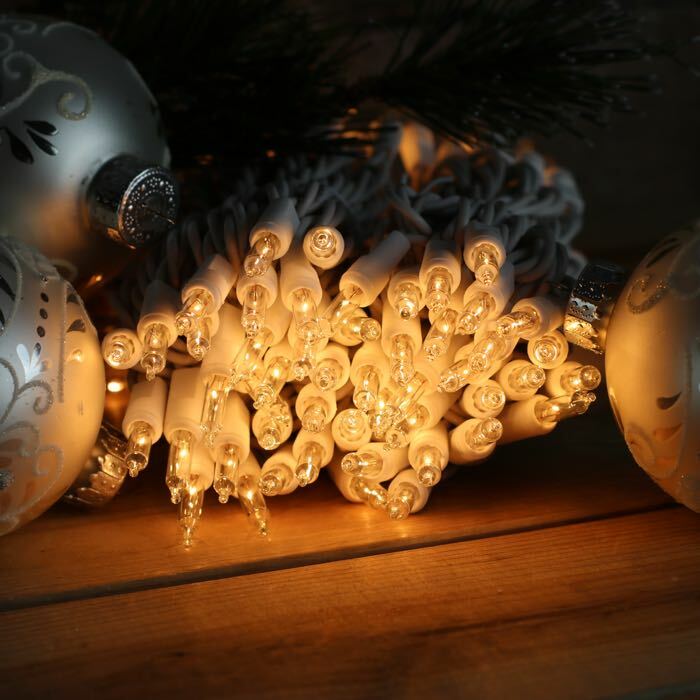 Your home will glow brightly with these white Christmas lights on white wire. They are one of the most versatile products for year-round use in your home. 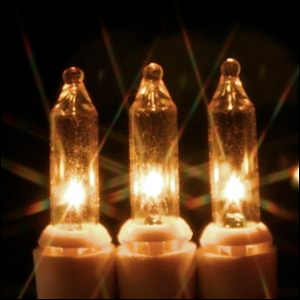 Holidays and special occasions will benefit from the beauty and sparkle of these Christmas lights on white wire. Want a dramatic outdoor lawn? Drape these lights over your shrubs and outdoor structures. The 6-inch spacing is ideal for wrapping trees and columns. Each string of lights has 100 clear bulbs with just over 51-inches of length. Remember the maximum connection is 5 sets before you add an additional extension cord. White lights on white wire are a great solution to those events where green wire will not coordinate. Choose them when you desire the wire to blend in with the surroundings, for events such as wedding receptions or bridal showers. Whatever the celebration, these Christmas lights are sure to make your event shine. These lights were ordered for a prom. Worked great--not a single bulb was out! October evening wedding will be perfect with these lights. Tested them for just the perfect glow. A: These light strings are rated to run 5 in series. They may have a larger wire gauge than sets you've used in the past and/or higher rated fuses. The old "three sets" rule was phased out several years ago. For a long time UL held the position that any light string with a standard plug - even low current LED lights - could not be run more than 3 strings in series. Thankfully they've come up to date. For peace of mind and in accordance with "Murphy's Law", while there isn't an issue with plugging these lights in 5 sets in series, we always suggest that customers always test out lights before a big event to make sure there are no manufacturing issues. Also, plug your lights in before you start to install - sometimes bulbs can become unseated during shipping or during installation and it's good to test as you go. Hope this answer helps - let us know if you have others. Q: Will the bulbs stay lit if some of them are broken, missing or blown? Thanks. A: No - these light sets will stay lit if a light burns out (is blown) but will not stay lit if the bulbs are broken or missing. Removing a bulb or breaking the socket breaks the electrical connection.